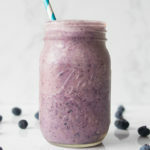 Blueberries and Café Latte Vegan Shakeology may seem like an odd combination at first, but after one sip of this Vegan Blueberry Latte smoothie, you’ll see that you’ve been missing out on a stellar pairing this whole time! This vegan smoothie is made with bluberries and almond milk. Place almond milk, ice, Shakeology, and blueberries in blender; cover. Blend until smooth.